About two feet long. Glossy greenish black head and neck. Black back fading to ashy gray on lower back and tail. Brown wings with a black bar across white coverts. White breast with a pinkish tinge. Toothed red bill. 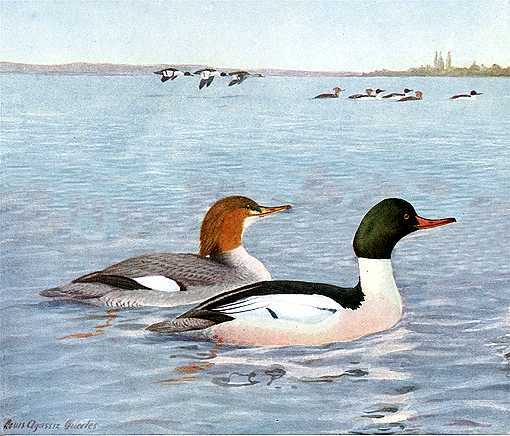 Common mergansers inhabit North America, nesting from Minnesota, the Great Lakes region and New England States far into Northern Canada beyond the tree limit, much further south in the western states. They winter from New England states, Illinois, and Kansas southward and in western North America from British Columbia to California, Texas and Mexico. Also common in Europe, Asia, Iceland, Greenland and the Orkney Islands. They dive for fish, frogs and mollusks. A gluttonous bird that often swallows fish so large that it must wait to swallow completely until the fish’s head is digested. Such adept swimmers, they will dive into raging torrents after fish and even under ice until water is nearly completely frozen over isolating them from their food when they finally fly south in small flocks of six or eight. Build nests of leaves, grasses and moss lined with their own down in tree hollows, cliffs and nest boxes. Females lay six to sixteen ivory-white eggs around June which hatch after about one month of incubation. Young are led to water and tended to while still quite young and learn to fly at about two months. The Common Merganser Nest Box has a 10″ by 10″ floor, 33″ inside ceiling, 5″ by 5″ square entrance opening located 30″ above the floor (to the top of the opening) and ventilation openings in the floor and under the roof. 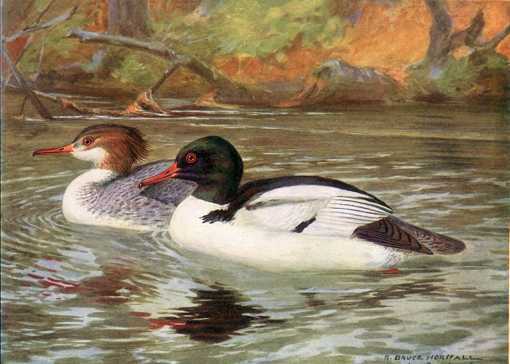 Common mergansers inhabit North America, nesting from Minnesota, the Great Lakes region and New England States far into Northern Canada beyond the tree limit, much further south in the western states. They winter from New England states, Illinois, and Kansas southward and in western North America from British Columbia to California, Texas and Mexico. Also common in Europe, Asia, Iceland, Greenland and the Orkney Islands.